Upon entering Hege Library, one of the first things visitors encounter is an astounding array of visual art. As the "scholarly crossroads" of the Guilford campus, the library offers an ideal location for the Guilford College Art Gallery, which has, as part of its mission, the goal of promoting interdisciplinary approaches to the study and interpretation of art. 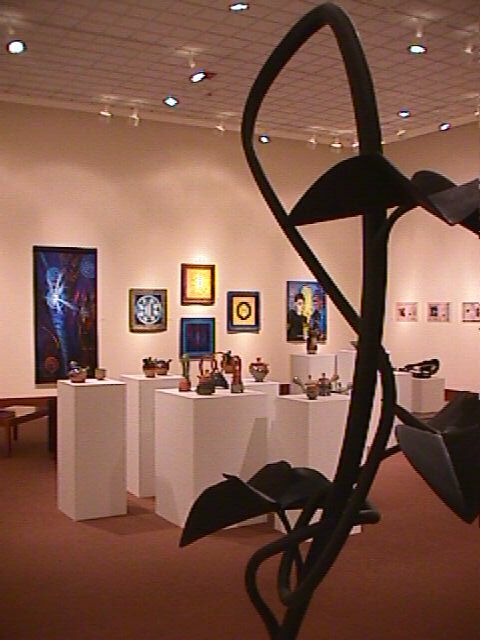 Original works of art are displayed in galleries and study areas throughout the library and other campus buildings, offering students an incomparable opportunity to live with and view works of art, to analyze and study them in a variety of contexts, as well as write about and discuss them. Guilford College Road and proceed approximately two miles. Cross West Friendly Avenue (stay in right lane). Turn right at the first traffic light after W. Friendly onto campus. and at the Arcadia Lane entrance to the college. Atrium galleries and vitrine displays are open during Hege Library hours, which are seen below.